"What are we doing, Gramma?" Her gaze was suspicious because she's five years old now and knows better. Grandma was going to encourage her to do something her young brain sees no point of. But for me a 5-year-old child's mind is primo territory for planting seeds of global awareness. Every year Toms Shoes holds the One Day Without Shoes event on April 16. Since Rylee recently acquired her first pair of sparkly multi-colored Toms I wanted her to understand the mission of Toms Shoes. 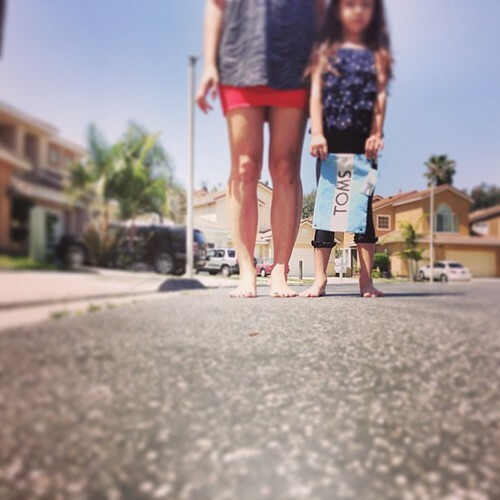 I explained we would be walking barefoot to the post office brandishing the Toms flag to pique curiosity. We'd begin telling them about the hookworm parasite that "affects 740 million people worldwide." Toms shoes wants to educate people, provide medication, improve hygiene and sanitation, and provide shoes that will prevent people from suffering the long-term physical effects of hookworm. After reading the information off the web-site to her she shrugged but willingly followed my lead. We removed our shoes, took our photo above, and walked a few steps across the street. We didn't make it. The scorching asphalt burned the soles of our feet so fast I swear I heard sizzling. We did some two-step-hop-skip-and-a-jump dance back to the house with my tail tucked between my legs. Rylee stomped her seared sole with indignation. "I'm over this I just wanna play outside!" Oh, the nerve. My intentions went bust and I could only hope that a kernel of a seed was planted in the fertile soil of her brain until it flourishes in due time. 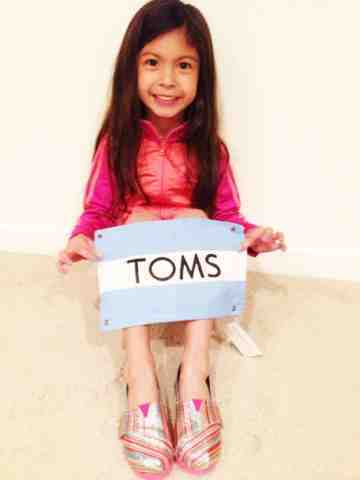 Or maybe one day she'll look at her old sparkly Toms shoes and remember her Gramma was crazy for global issues.